Eat Chipotle and help raise funds for PAMANA! Stop in at Chipotle to dine in or take out anytime from 5:00pm - 9:00pm and PAMANA will earn 33% of the proceeds. Bring your whole family, friends, neighbors and co-workers! The more people we have eat at Chipotle, the more funds raised for PAMANA! So spread the word! 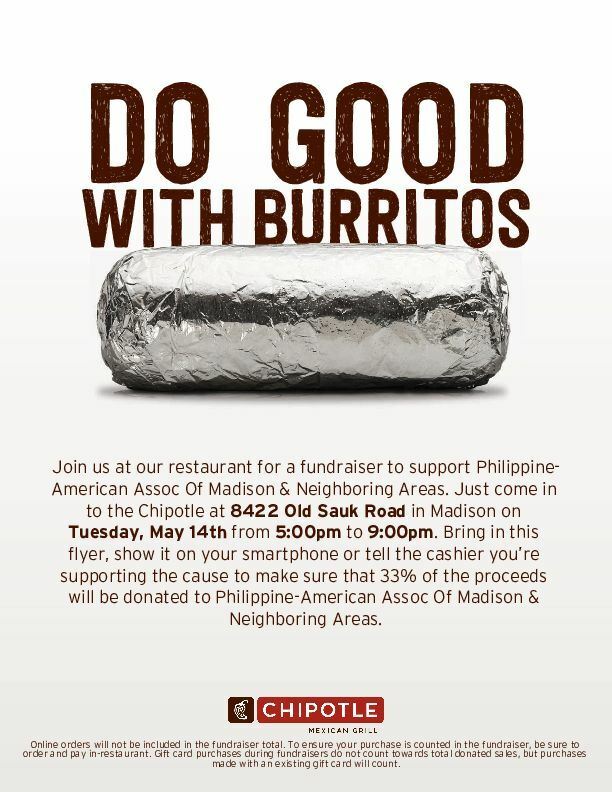 Please mention the Philippine-American Association of Madison and Neighboring Areas (or PAMANA) or show the cashier the flyer on your phone when you place your order. This ensures your order will go towards the total sales for PAMANA. Thank you for supporting PAMANA!